Don’t worry the name is more complicated than the food it’s self! What is Stromboli you’re wondering? Well basically, its a pizza roll! – Simples! …. No, it really is!…. would I be making it if it wasn’t?? The first time I made this for the family, the kids loved it! This is a real game changer, Anyone can present pizza, lets be honest! But it takes a cool mumma to whip up a Stromboli! Cooked mince, Pepperoni, Veg or whatever you want to fill with. Line large baking sheet with baking paper, or rub with oil, or spray lightly with non-stick cooking spray. Spread pizza dough out on baking sheet to be approximately 10x16. 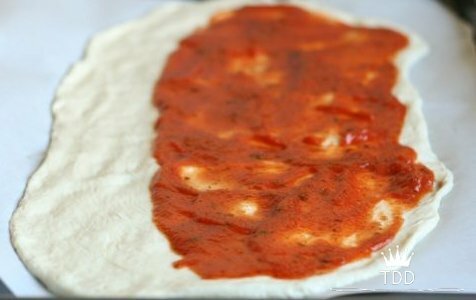 Spread pizza sauce over 2/3's of the dough lengthwise, leaving a 3x16 rectangle of plain dough along one of the edges. Top sauce with half the grated cheese, and whatever filling you're using. Top with remaining cheese. Brush the plain strip of dough with the egg. Fold in the sides about an inch and brush them with egg. Roll up like a swiss roll lengthwise starting along the long edge of dough topped with all the fillings and ending with the plain strip of dough on the bottom of the roll. Brush the entire Stromboli with egg and gently cut slats in the top of the dough every 1-2 inches. Sprinkle parsley and cheese over top and bake 8-10 minutes or until bubbly and golden. So now you can serve this game changing Stromboli whenever you want to wow the crowds! Question is, what will you fill yours with? Let me know in the comments below! Post your pics with the hashtag #bishbashbosh & tag @thrifdee_dubai & don’t forget to share!! Previous Post Expense Tracker – Get Thrifty! Next Post Can You Handle The Challenge? The recipe looks easy and the pictures turned out great. Thanks for sharing another great recipe :). I made your apple muffin btw and liked it :). And I always have cooked beef sauce cuz my son loves that and I am always looking for what to do with leftovers! Oooh…I’ve made calzones but not strombolii. I actually like how this looks so might give it a try. oh this looks so yummy! Will be trying this soon, I think my kids will love it – thanks for the recipe! You are absolutely right! It takes one cool mama to whip this up! I think I would fill it with more cheese! HAHA! I’m an absolute cheese lover! Perhaps some veggies, because lets be realistic, we need to stay healthy! Ohh Iam drooling …this looks yummilicious !! Always a true lover of cheese & will definitely try this recipe. Stromboli😍in shaa allah will try them soon. This is going to my plan in shaa Allah for week 1.